Queensland Rugby Union today announced Rinnai has signed on as a St.George Queensland Reds partner for the 2016 season. An international company with offices in 20 countries, Rinnai has operated in Australia for more than 40 years, providing specialist hot water systems, heating and air conditioning solutions. The company’s logo will feature on the collar of the Reds Super Rugby jersey. 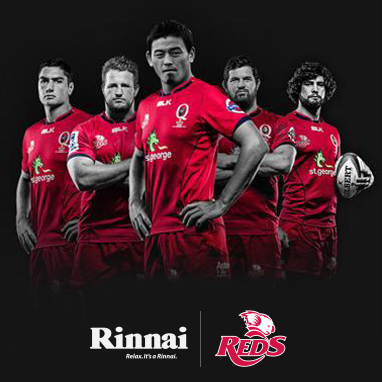 Rinnai Australia Managing Director, Greg Ellis, said: “Rinnai Australia is excited to be a major partner of the Queensland Reds in 2016 as Super Rugby continues its expansion not only locally but also internationally. Queensland Rugby Union CEO Jim Carmichael said: “We’re thrilled to announce QRU have secured another international blue chip organisation. “This partnership is a testament to the reach of Rugby in Queensland and the opportunities that exist for our corporate partners, not only with our Super Rugby team, but with the game at the grassroots level.